Some people’s creative impulses never rest. 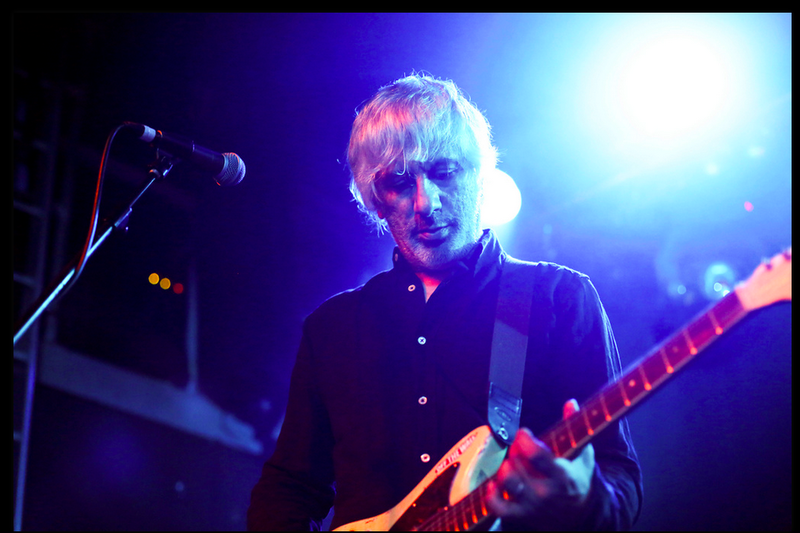 Best known as a co-founder of the legendary alternative rock band Sonic Youth, for over three decades Lee Ranaldo has been an avant-guarde musician, music producer, author of poetry books and a creative visual artist. After working on a few abstract music solo projects following the indefinite hiatus of Sonic Youth, in 2012 Lee finally released his first proper solo record, the critically acclaimedBetween the Times and the Tides. He’s now back with the follow-up Last Night on Earth(released via Matador Records back in October) which is darker in tone and lyrically, but more cohesive and stronger than its predecessor. I had the pleasure to meet him before he played an ace show at the Garage in London (photoshere), supported by ex (?) bandmate Thurston Moore who then joined him on stage for the encore to play a cover of Velvet Underground’s ‘Rock and Roll’. Lee is unbelievably nice, professional and caring. There was a bit of drama about the logistics of our interview, but Lee was the first one trying to sort out things to make me feel as comfortable as possible. Here is our chat about the circumstances in which he wrote most songs of Last Night on Earth as well as the concern about the current state of the environment and his recent trip to India. Last Night on Earth just came out. Do you want to talk about the album production and if there were any differences with Between the Times and the Tides in terms of writing and recording? Lee Ranaldo: the writing process wasn’t too different as I have been writing songs on a acoustic guitar these days and that’s pretty standard. But the thing that was very different is that when I made Between the Times and the Tides, I wrote the songs then I started tracking them in the studio and we kind of built up the music around it with (Sonic Youth) Steve (Shelley) on drums and the bass player, then everybody else that played on it came in after the songs were recorded and put down parts and ideas. Also when I was making Between the Times and the Tides I wasn’t even thinking about putting a band together or anything like that, I was just thinking about making a record. But then we all started playing behind it once it was done and in the course of a year or a year and an half playing together we became a proper band. So for Last Night on Earth we rehearsed for a month before we recorded it and really worked on the arrangements of the songs, so it was much more of a band effort. That’s why the album has a band’s name on the title as it was really a product of a band, unlike the previous record that was more a solo effort. How did you come up with the name the Dust? Lee: We were actually talking about it yesterday. I really don’t remember how we came up with it. I think that maybe we drew inspiration from the book by John Fante Ask the Dust. But I don’t know as I don’t think I come up with it myself. We were just goofing around thinking that we should have a band’s name, so we came up with hundreds that didn’t work and not everybody agreed on. And then someone came up with The Dust and we all said “OK, we could live with that” and it just stuck. I like it because it doesn’t imply anything too grand. You know, everything is going to be dust at some point…. I was just curious because I know that most of the new record drew inspiration from the aftermath of Hurricane Sandy. So I was thinking that maybe the two things were linked. Lee: That’s actually an interesting point. It’s true that a lot of songs on it got inspired by Hurricane Sandy and started being written that week, but it’s not a concept record or anything like that, as not all the songs are about that. I was actually kind of afraid that with that title people might get the impression that the whole album was influenced by that. Having said that, a couple of songs were, like for instance the title track. We were out of power, water and electricity for about a week and there wasn’t too much to do in the evening by candle light as phones and computers were also all dead, so I just spent a lot of time strumming on guitar and coming up with a few different songs. And yes that week I was kinda inspired by what was going on in New York, because I think it brought back that 9/11 feeling downtown as we were walking on the streets with no lights from either the inside of the buildings or the street which was kinda eerie and weird. So that week inspired the song “Last night on earth” which is a kind of science-fiction story more than being about Hurricane Sandy itself, then also ‘Blackout’, obviously, and ‘Late Descent #2’, that was written that week but doesn’t really have much to do with it. So as you also mentioned 9/11, do you think somehow the choice of the name “dust” was unconsciously influenced by that feeling that Hurricane Sandy brought back? Lee: Yeah it could be. It’s interesting because recently someone mentioned online that the word “dust” comes up in a lot of my lyrics, but like I said I don’t think I came up with that band’s name. Though I like the idea of dust. It’s all around us…. Is the current state of the environment something that worries you in your every day life as well? Lee: Well I think everyone is worrying about it at the moment mainly for the weird weather, all these crazy storms and stuff which didn’t come before. So people are hyper about it right now. For instance in New York the hurricane really woke a lot of people up last year as Manhattan had no defense against rising water and anything like that, so the city got crippled afterwards. I think people are finally understanding that maybe global warming is real. Maybe? (laughs). Earlier on you mentioned the song ‘Late Descent #2’ which has a very interesting baroque sound. It’s a harpsichord, right? Lee: Yes. Originally that song was just me on vocals and acoustic guitar. But then I was obsessing over this old song from the 60s which had harpsichord on it and the week before Hurricane Sandy I was commissioned to write a piece for a string ensemble in Berlin, a 14-player group and I wasn’t sure what to do with it. The day of Hurricane Sandy there were all these crazy sounds outside the window, the wind pushing through the window and fireplace and it sounded like weird music, voices sometimes very beautiful, sometimes very discordant and ugly. So a couple of hours before the storm I went out and recorded 15 or 20 minutes of it, when the water was coming over the river and onto the road and things like that. Then I transposed those sounds to piano and turned it into this piece for the string ensemble. When we presented it in Amsterdam in June, one of the other pieces they did that day had harpsichord on it, played by this girl from Berlin, and as somehow harpsichord had been on my mind already I asked her if she could try something. She wasn’t sure at the beginning as she is a baroque musician and doesn’t know much about pop music, but then she agreed to try something. So we sent her the tape over to Berlin, she played harpsichord on a recorder and sent it back to us. Then I wanted drums and guitar to be on it too, and we recorded those open air in a castle in Southern Italy. So that song is mainly built around field recordings, and I’d like to think that has more of a casual vibe as things were slapped together in a different way. You recently reviewed the Grateful Dead movie about a concert that was filmed in Oregon in 1972. Do you think they somehow influenced Last Night on Earth musically? Lee: The album was pretty much done when I saw the movie, but yes that’s coming back to what I said before about this record being more built up by a band since the beginning, as I just wanted it to be more an open session where the band could just let loose and experiment a little. And in that sense the Grateful Dead were always like that to me. I have always thought that there were some similarities between them and Sonic Youth, like being able to move from a song to a jam and back, whether that was a hippy style jam or a noise style jam, and also having three singers up front, and there are lots of other different ways on which they overlapped. There was a time when I listened to the Grateful Dead very much, but I hadn’t listened to them in a long time when I reviewed the movie, so that gave me a new appreciation as that film is really good. What’s the concept behind the album artwork? Lee: I am a big Instagram user and for a while I was experimenting with lots of fisheye lenses so I wanted to have a fisheye picture on the cover. We had the photo shoot with Michael Lavine who had shot Sonic Youth many times over the years and had some fisheye ideas. And then I sent those pictures to this guy from Massachusetts, Ted Lee who does lots of paintings and asked him if he could incorporate something. He sent back the mock-up of what became the cover, and though that wasn’t one of my favourite photos, somehow the way it looked, with the black sky and the smearing red made sense and suited the title of the record. So we all worked together on the artwork but it started with my idea of having a fisheye picture. You recently played a few shows in India. Was it your first time there and if so how was the whole experience? Lee: Yes it was my first time there and it was insane and incredible. We played a couple of regular shows in clubs in Bombay and Delhi, and then we played this small festival in its second year which was really in the middle of nowhere, the furthest place from civilization I had ever been in my life. We had to land in this little town called Guwahati, then we drove for 16 hours off-road to get to this beautiful valley. It was very difficult to get there and then go back, but it was incredible as people there still live in the old way, in bamboo houses and also the stage was totally made out of bamboo with no nails, no metal or anything. That’s in the Northeast corner of India. People there look more Vietnamese than Indian. There was a lot of rice fields. Spending almost the whole week there was incredible and wild. I’d been pushing to go to India for many years so when the opportunity came it was very cool. I am going to spare you any questions about Sonic Youth and their future which I am sure you got tired of being asked, but I would like to know how it feels to front a band in comparison with being part of a collective when on stage. Lee: Well it’s different. One thing that made Sonic Youth what it was, like you said, was being a collective where everybody contributed to writing a song and making every decision, whereas when each of us goes out doing their own thing, we are each our own director. So now that I am writing my own songs I am the director of my band, as Kim (Gordon) is with her project and Thurston (Moore) is with his. So yeah it’s pretty different. And at first for me it was pretty different to sing everything rather than just singing on one or two songs in a set, but that has actually been pretty fun. I think the main thing for me is being pretty confident about the songs, as if I hadn’t been confident about the songs it would have been hard to do. Also I am pretty confident about the band as they are really cool, I can sing fronting this band because they can do so many different things. For instance we have been to France last week and we played an all acoustic show, with a stand up bass, acoustic guitars and no drums. We are very flexible, we can play acoustic shows occasionally and electric shows of course, and if we hear a song on the radio we can just learn the music pretty quickly. So I have to say that overall it has been very fun. Can you talk about the On Jones Beach album you released with your other band Glacial last year? I find it a very interesting and different record. Lee: That’s a project that has been going on for a while now but we hadn’t released any proper recordings. It’s me on electric guitar, David Watson, a guy from New Zealand that has been living in New York forever, who plays bagpipe, and drummer Tony Buck from the Australian band The Necks. So it’s a strange combination of an Australian, a New Zealander and a New Yorker. We have played some great gigs together, unfortunately none last year or this year, but some years we played 6 or 7 times. Then one year, probably 6 years ago, we played together in New York, we recorded it and that recording became the album which came out last year. It got a very good reception. Tony is a very fun drummer to play with, he makes it so easy to make improvisations on top of what he does as he is such a strong drummer. So David and I always have lots of fun. Is there anything in your music career that if you could go back in time you would change? Lee: I don’t know. It has been pretty amazing overall. Sonic Youth has never been a commercial band, and yet we managed to have such a long career both releasing records overground and on big labels, and also smaller projects on smaller labels, and we have been able to work with our heroes… so I don’t think there is too much I would change. Maybe in some way it would have been nicer if these solo records had happened a bit earlier, but things happen when they happen. There were a couple of times when I was pretty strong in my mind, but for one reason or another it just didn’t happen mainly because for me it would have been impossible to do what I am doing now when Sonic Youth were so busy together, as this is a full time occupation. So yeah it would have been nicer if this had happened something like 10 years ago but it’s happening now and I am perfectly happy with the way it’s happening. I don’t think I would change too much (laughs). Are you working on any visual art projects at the moment? Lee: Yes, I do lots of drawings these days, somehow I always tend to do more drawings than paintings though I trained as a painter and a printer. I have been doing these drawings of empty highways while sitting on a tour van, which is a project that actually started many years ago, in the mid 70s when I was an Art student and did one project when I was trying to draw the highway as you’re moving through it and it’s constantly changing and you are trying to get down and draw a few lines very quickly. I had forgotten about that, but in the last few years I have been doing tons of these drawings and then I got reminded about the fact that I started doing something similar so many years ago. I had a show in Portugal a few months ago, then one in Belgium in March. There are actually a few drawings on my website if you want to take a look. Is there any new band you’ve been listening to that you think is going to have an impact on the future of music? I know. That’s why I was asking more about a band that you think is going to have a great impact rather than just a band you like, as to me everything has been kind of derivative and samey over the last few years. Lee: Yeah I agree unfortunately. There is actually this band, called the Magik Markers, which I produced 4 years ago or something, and with whom we played the other night and we are going to play a couple of more times in the next weeks. They are phenomenal. But in terms of a band that’s going to have a great impact on the future of music, I am not sure as everything is so fragmented now, and internet has contributed to it as bands are constantly coming and going very fast. Back to the Magik Markers, they started out as a noise, experimental band but then they developed into something more melodic. They are not a new band or anything but it’s a band I have kept watching for a while and I still find quite inspirational. Last Night on Earth is out now on Matador Records. 112913 | Filed under INTERVIEWS. Very cool interview. What a detailed account of the new album! Thanks for posting this.